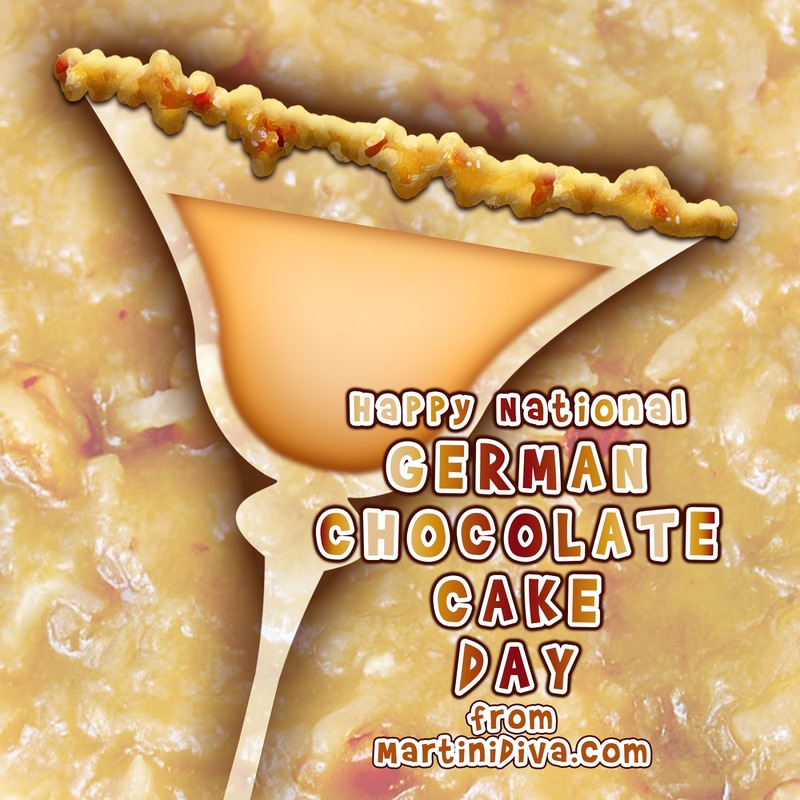 HAPPY NATIONAL GERMAN CHOCOLATE CAKE DAY - Drink It Up! 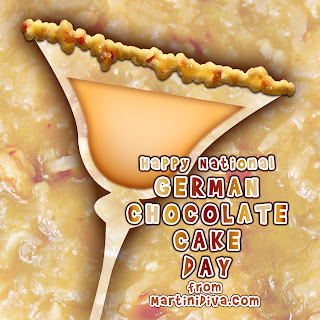 Contrary to popular believe German Chocolate Cake does not come from Germany, it is an entirely American creation. It was originally called "German's Chocolate Cake" after a 100 year old baking chocolate created by Sam German for the Baker's Chocolate Company. Mrs. George Clay, a Texas housewife, used that chocolate in the recipe she sent to The Dallas Morning News in 1957. The recipe was picked up and reprinted by General Foods who owned Baker's Chocolate at that time and it went fifties style viral and ended up one of the most popular cakes in America! To bring in the cake flavor I used Cake Vodka, and for the coconut I used Cream of Coconut which really adds a sensuously creamy and sweet coconut flavor. And for the chocolate I used Godiva Chocolate Liqueur and sprinkled a few milk chocolate shavings on the top. But the best part is the rim - I grabbed that coconut pecan frosting and piped on a nice, thick thread of it across the whole rim! You can use shredded coconut if you would like, or even coconut & chopped pecans but the frosting is what really brings home the whole German Chocolate Cake Experience! Pipe two tablespoons of coconut pecan frosting on to the rim of your cocktail glass then fill your glass in the freezer. 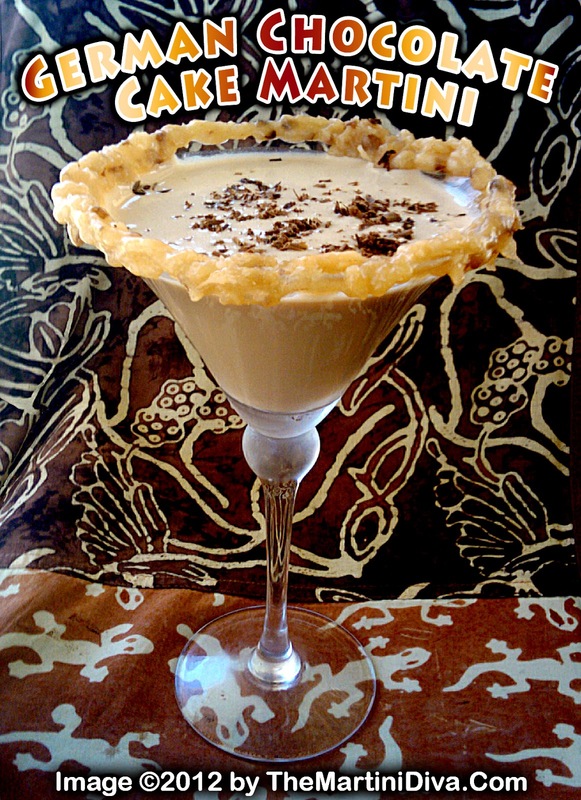 Strain into a cocktail glass, garnish with some milk chocolate shavings and serve.